Damh needs no introduction for most Pagan music fans. His albums are sold all over the world and his latest release, Sabbat, shot to number one in the folk charts within hours of its release. Damh took a break from celebrating to have a little chat with me about music, life and druidry. Damh the Bard: Surreal and wonderful. I saw it had reached number 7 which surprised me, but when I looked back a couple of hours later it was at number one. It’s quite a moment to be honest that made me look back over the journey. There have been a few moments like that. Like standing in front of Sydney Opera House, or the Statue of Liberty and just taking a moment to reflect and honour the journey. How the decision to learn to play the guitar at age 8 led directly to that moment. MS: What was the biggest challenge with the new album? 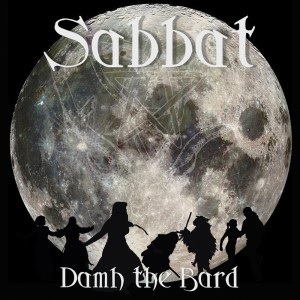 DB: I have to say that of all the albums I’ve made Sabbat was the easiest and most enjoyable. The hardest was Antlered Crown and Standing Stone. When I finished The Cauldron Born I thought that was it, I would never make an album as complete as that one. It took 4 years to return to the studio with my own songs and I was always trying to still that voice, the one that says, “It won’t be as good as Cauldron”, but then as it progressed I realised that every album is a different journey, and that we can’t be defined by our past when it comes to music. A songwriter is on a journey, and it’s wrong to try and emulate the past. By the end I was really happy with it and it was a well-received album. That process put to bed the voice so when it came to Sabbat I just surrendered and enjoyed it. MS: Do you have a favourite track from ‘Sabbat’? DB: Not a favourite as such, but as a songwriter I do have two songs that, to me, are the most complete songs I’ve ever written, that’s Time Machine and Iron from Stone. The process of writing and recording those two songs felt quite different and lyrically I’m really proud of them both. But then when I think about it there isn’t a song on this album that I’m not proud of. Forgotten, Never Be, Sabbat, Thundersbarrow Hill. No I haven’t got a favourite. I love them all. MS: What does the term ‘Bard’ mean to you, and why is it important for you to be known as one? DB: I think you have to look at the Bards of history to see why I love this word and the Bardic tradition so much. Taliesin, Myrdhin, Amergin for example. We have to forget all about how we consume music, poetry and art to truly understand the power of the Sacred Poet. is magic, words are magic, combine the two and you have the Keys to the Otherworld. When we can hear almost any song on Spotify or our popular view of music is a karaoke competition for instant fame, it’s easy to forget its power. But words, music, spoken and sung, can open doors and to me the Bards were and are the Shamans of this island. Because Druid Orders like the OBOD have the Bard as the first level of training some might see them as an entry-level Druid. But it’s not like that. The Bard, with the stories and songs of the Gods is the foundation of the Druid tradition upon which everything else is built. When a Bard becomes an Ovate, they don’t stop being a Bard; they are a Bard and an Ovate, and on it goes. When we travel in guided meditation we are told a story that we enter into. A good Bard will do that with the Mabinogi, or the tale of Taliesin. The same is true of songs where the melody and words combine to reach our emotions. It’s an act of magic. MS: How do you keep the ‘awen’ flowing; how do you stay inspired during the creative process? DB: With Sabbat it was walking my dog. The seed and lyric of almost every song came whilst I was out walking Oscar. So walking beside a river, out in the woods, across fields, out of earshot of any other human being. I was singing the tunes, filling the spaces with words, recording things on my iPhone and when I got back reaching for the guitar and writing the songs. Nature is the best source of inspiration. MS: Which of your albums is closest to your heart and why? DB: I love them all. A cop-out answer but it’s true. Each one has its own memories and when I listen to one that I haven’t heard for a while all those memories and feelings come back. The songs I write are spiritual songs, some are praise songs, and they are all deeply personal. MS: You’ve traveled all over the world with your music. What place holds the most powerful memories for you? DB: Ok… another answer that might sound like a cop-out. When I travel to any other country, be that the USA, another European country, Australia, Canada, wherever, and I play my songs and hear the voices of people singing along, not just with the choruses but from the first word of the verse it’s amazing: a dream. But I think for anyone from the northern hemisphere a visit to Australia will be a powerful experience. The first thing I did when I knew I was going there was to look up everything that could kill me on Google, and there were pages of it. The Sun moves across the sky anti-clockwise, the Moon waxes and wanes in the opposite way, the land, star constellations, animals and birds feel so different, it can feel like being on an alien planet. Then, when you open to the land itself you are fully aware that you are not the top of the food chain, that the land is King. I love it so much I wrote The Dreaming in honour of that huge continent. MS: And what place feels the most peaceful or spiritual for you; a place you can retreat to? DB: The moors and the Cornish coast are the places I retreat to. If I want to remember that’s where I go. The silence of the moors and the wildness of the Atlantic crashing against granite. Hard rain against your skin alone on the moor, the call of the raven above the Tor. It speaks to my wild heart. MS: How do you remain connected to nature when you are in an urban setting? DB: By not separating the mundane from the spiritual. I know that it can be hard but to me it’s one of the gifts of the Pagan path. To see the spiritual in what can be viewed as mundane. To bring those two seemingly diverse circles together. If we do that then once again, there is no separation. MS: With the UK general election having just passed, politics is on everyone’s minds. Imagine you were in the running; what would your top 3 policies be? DB: A ban on fracking; more emphasis on the arts in schools, and free home mead deliveries. MS: Has any party stood out for you as being good for Britain in the long run? MS: Why do you think more and more people are turning away from mainstream religion to Pagan paths or nature based spirituality? DB: If it is happening it’s because it makes sense. Even in this age of the New Atheist it makes sense to honour and revere the things that keep us alive: the sun, the moon, the Earth, plants, animals, nature. When I hear Richard Dawkins lay into religion, asking us to prove the existence of God, I just look out the window and see mine. MS: Do you consider yourself a Pagan? What does the word mean to you? DB: Yes, very much so, and proud to be such. As a Pagan I am part of a community and movement that contains a vast array of traditions and beliefs. Some say that this community is so diverse as to be irrelevant and almost non-existent. 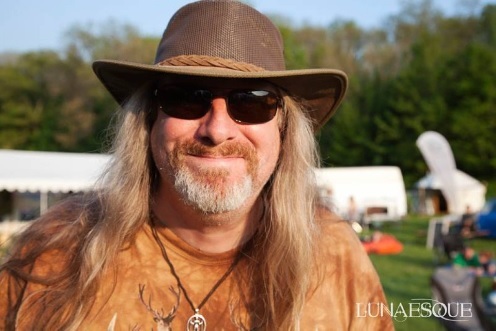 But I’m in the blessed position to be able to travel all over the world to play music at Pagan events, and I can tell you, absolutely, that the Pagan community exists, and is strong and thriving. We may disagree on the detail and it’s the detail that we disagree on that sometimes fills our Facebook groups with arguments. But there are huge swathes of common ground, and the community works best when large groups work from that space. So how I define myself as a Pagan is neither here nor there to anyone else. That’s my detail. MS: Is druidry something you do or something you are? DB: It’s both. At first I think it’s something you do, but then, over time, it becomes a way of life. That blending of the mundane and spiritual I spoke about earlier. MS: Do you believe music is truly a form of magic? MS: And finally, what’s next on the horizon for you? DB: My next project is a double album entirely based on the Mabinogion that’ll be called Y Mabinogi. It’ll be spoken word, music and song. Something I’ve always wanted to do and now the time is right. I’ll be posting regular updates on my blog as it’ll be quite some journey so watch this space! Damh’s new album ‘Sabbat’ is widely available as is his fantastic back catalogue. Keep up with Damh at www.paganmusic.co.uk.